Maximum needed a more imaginative title. That single word does little to convey the quiet grimness of this violent-yet-mellow film that has stayed with me since I saw it. It may seem like familiar territory, yet director Kabeer Kaushik’s exploration of the police-politician-builder-gangster nexus in Maharashtra is more intricate than the many repetitive films on the subject we’ve seen in recent years. Sonu Sood – who deserves a body of work to match that fabulous body and talent – is Pratap Pandit, a Mumbai policeman whose long-standing rivalry with fellow cop Arun Inaamdar (Naseeruddin Shah) defines both their careers. They are both unscrupulous, efficient encounter specialists with a wide network of informers; both cultivate and are cultivated by politicians and businessmen. The film takes us from 2003 when Mumbai is waging a battle with the underworld to the post-26/11 period, during which their enmity is chronicled by a young journalist (Amit Sadh). What distinguishes Maximum from other films set against the same backdrop is the understated and brave comment on the closed-mindedness of Mumbai, and the fact that the leading men are also the villains of the story yet make no bones about their amorality and display no desire whatsoever to reform themselves. Pratap is not just a murderous cop, he’s also got a roving eye; he spends his nights at dance bars and has an affair with a film star (Anjana Sukhani) while his wife (Neha Dhupia) takes care of his home and child. The Mrs is aware of his shenanigans, but like us, he seduces her too although his faults stare us in the face. Some of this has to do with the fact that Sonu Sood is a really attractive guy with an extremely likeable personality – that was evident when we saw him as the towering Prince Sujamal in Jodhaa Akbar, and even when the shirtless Chhedi Singh’s intimidatingly expansive, well-muscled torso was punched and pummelled by the diminutive Chulbul Pandey (Salman Khan) in Dabangg. But most of all, Pratap Pandit works because Sonu is a remarkable actor. Just watch that fleeting expression on his face when he first spots his actress lover to know that. Sonu has good company in Maximum’s splendid cast: there’s Sadh whose journalist defies the Hindi film norm; Vinay Pathak plays a Maharashtra politician with a soft corner for Pratap, reminding us that he is capable of so much more than the goofy simpleton he’s been stuck with since the commercial success of Bheja Fry; lyricist Swanand Kirkire is a revelation as Pratap’s colleague; even Naseer appears more involved than he sometimes seems in his films these days. Having said that, though the screenplay explores Pratap’s life and character with great depth, little time is spent on Naseer’s Arun Inaamdar beyond the shootouts and backroom politics. If I met Pratap’s wife, saw him in hospital waiting for news of his unwell father and watched him accompany his daughter to sports practice, then I’d like to have known the Arun behind the policeman too. This is my one big grouse – and it’s a very big grouse – against the film’s otherwise strong writing by Kabeer Kaushik and Rakhi Soman. You can’t claim that you are telling us the story of “two cops, one journey” and then neglect Cop No. 2. This is unfortunate since the script has so much else to recommend it, so many subtleties and so much home work: the journalist, for instance. Hindi film mediapersons are usually on extreme ends of the integrity spectrum: so Bachchan’s TV channel boss in RGV’s Rann was almost a saint, while every single TV reporter in Anusha Rizvi’s Peepli Live was a sellout. The journalist in Maximum is painstakingly honest in one respect (he is struggling to get a house in Mumbai, but will not allow Pratap to call one of his builder contacts for him); on the other hand, it’s evident that he is far too involved with Pratap’s life to have the distance that a journalist requires to tell a story objectively ... well, like the confusingly likeable Pratap, this man felt real too. 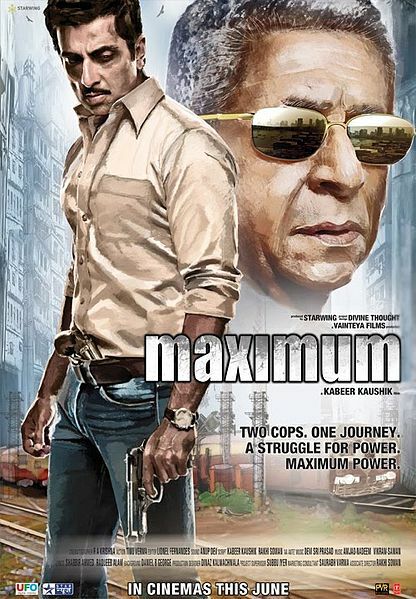 Maximum’s entire soundtrack is worth a recommendation, in particular Amjad-Nadeem’s Aaja meri jaan sung by Tochi Raina and Ritu Pathak; Daniel B. George’s excellent background score; and Devi Sri Prasad’s foot-tapping Aa ante Amalapuram with its amusing lyrics by Raqueeb Alam (it’s a joy to hear singer Malathy belt out the words “Yindian rhythm” in the song). Even Hazel Keech as Aa ante’s dance bar girl with the voluptuous body and visible love handles feels so much more believable than the gym-toned actresses who usually do such numbers these days. Krishna Ramanan’s camerawork is like the rest of the film: much thought has clearly gone into it yet it seems effortless, never more so than in that long shot of Pratap striding towards us, his gun placed in his trousers’ front pocket, prominently and precariously close to his groin. Ramanan gives us a Mumbai of cloudy greys, in keeping with the tone of a movie in which a politician with the surname Tiwari tells a young journalist from Lucknow: Yeh sheher jagah toh deta hai, lekin apnaata nahin hai. In the era of Raj Thackeray’s Maharashtra Navnirman Sena, that’s a gutsy statement to make; and it’s made here without any chest-thumping or flag waving, sans a sloganeering tone. A pity that Maximum comes to theatres with such minimal publicity.